The sense of hearing can gradually diminish with age. This age-related change is known as presbycusis. However, hearing loss may be present for other reasons, or had started earlier in life and worsened with age. It should not be accepted that the elderly will naturally suffer from ‘deafness’. Changes in senses need to be carefully assessed in order to identify underlying problems that may be the root cause. Sound waves in the air enter the ear canal to hit the eardrum, thereby causing it to move. These vibrations pass to the bones of the middle ear connected to the eardrum. This in turn passes the vibrations through the fluid of inner ear and causes tiny hairs to move. It stimulates the auditory nerve and signals are sent to the brain, where they are interpreted as sound. There are broadly two types of hearing loss – conductive or sensorineural. Physical problems with this movement of sound waves through the ear result in conductive hearing loss. On the other hand, damage to the cochlear hair cells or nerves results in sensorineural hearing loss. Heredity and prolonged exposure to very loud noises cause hearing loss over time, apart from the age-related changes that are seen with presbycusis. Deafness is a term attributed to complete loss of hearing. It is rare for deafness to occur suddenly except where there are injuries to the hearing apparatus or brain centers that decipher the incoming signals. Symptoms tend to develop progressively over time. Seniors may not always report the hearing loss and certain changes in behavior need to be noted among the symptoms. 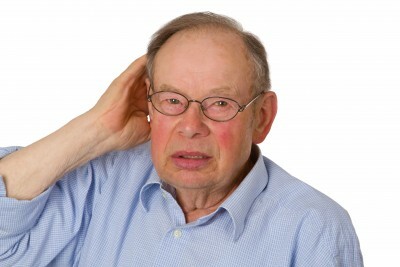 What causes loss of hearing in the elderly? Wax accumulation, noise, increasing age, and infections (more likely in children and young adults) are the most common causes leading to hearing loss. Some of these causes may lead to temporary hearing loss, while in other cases it can be permanent. Removing earwax which may be causing the conduction of sound waves often reverses hearing loss. Toxic drugs that may be contributing to deafness should be changed or stopped with medical supervision. Hearing aids amplify sounds and direct them into the ear canal. It is not suitable for every type of hearing loss. Cochlear implants are recommended for cases of severe hearing loss. It compensates for damaged or non-functional parts of the inner ear. Brain stem implants are recommended for patients with damaged auditory nerves. The implants consist of electrodes, sound-detecting, and sound-processing devices. Benign growths and malignant tumors of the ear, nerves or brain need to be removed. Corticosteroids are sometimes beneficial in treating hearing loss caused by autoimmune disorders. Reconstructive surgeries are sometimes performed for a damaged eardrum or middle ear bones.